To tag or not to tag, that is the question. At first I thought I would rely on my memory, ID skills, and a written planting chart to keep track of the trees planted at the farm. I thought tree tags looked too messy. They can also break, fall off, get lost, get eaten up by the tree as it grows, or choke the tree if they are too tight. Some people use tree tags that are placed on the ground. These can get knocked down, misplaced, or buried, especially when you need to do weeding around the tree. 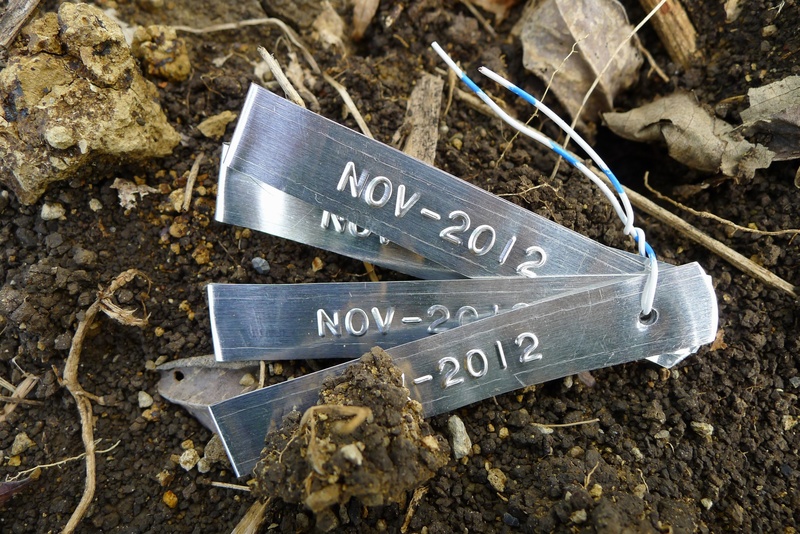 I even read about orchard owners who bury their tree tags under the ground as a fail-safe backup tree tag. Soon after we planted our first few trees, I realized that my memory and a planting chart wouldn’t cut it. I also needed a great tree tag! There are many different types of tree tags. 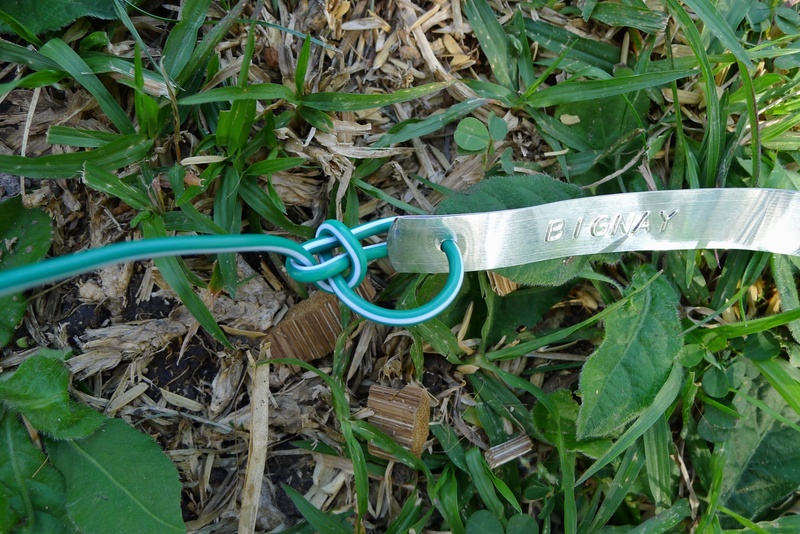 I wanted a tree tag that is durable, adjustable, economical, easy to read, and attractive. This is what I came up with: metal Dymo labels. I use Dymo aluminum self-adhesive tape. 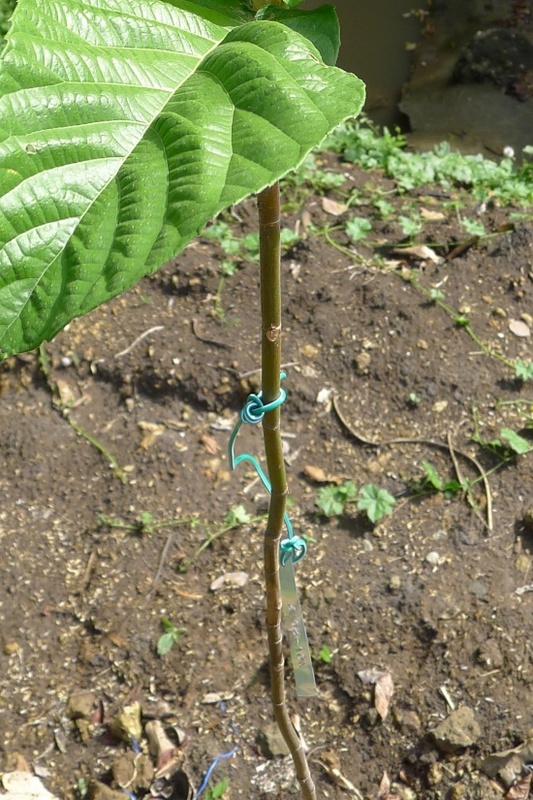 First I emboss the name and the date the seedling was planted. Then I remove the backing, fold the label in half, and press down so it becomes a double-sided label. I finish it off by punching a hole on one side. This Dymo tape requires a special Dymo machine. 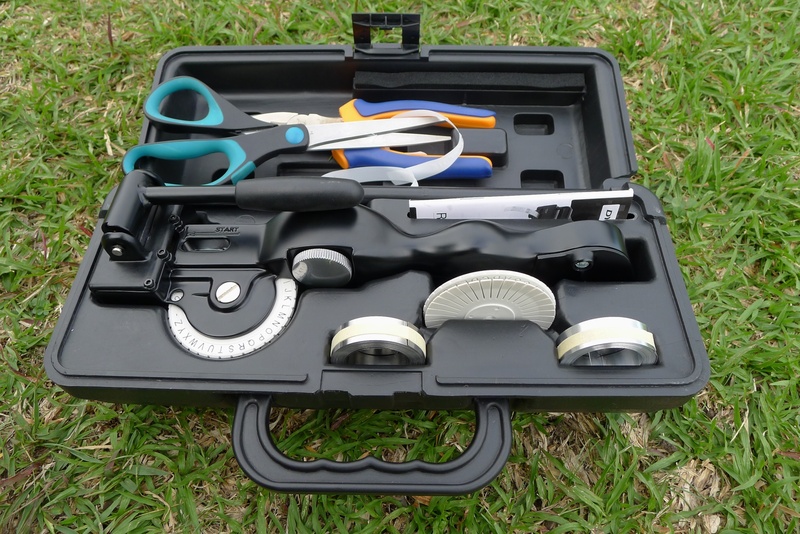 The tape is 1/2″ or 12.7 mm wide and will not fit in regular Dymo embossing machines. The label maker model is Dymo Rhino M1011. It comes in a plastic case. It has two built in hole punches. One is a small round hole and the other is a rectangular cable tie slot. It also comes with a reverse image wheel. The other kinds of tape that work with this machine are non-adhesive aluminum, steel, and self-adhesive plastic. The steel tape is heavier and more expensive. I think that since I am doubling up the aluminum tape, it should be very sturdy. I found it too thin and flimsy to use single layer. These tags meet my requirements for being durable, easy to read, attractive. They are somewhat economical because I was able to buy the tape at a warehouse discount store for a very good price. The ones I got were PhP175.00 for a box of 10 rolls. That comes out to about US$0.42 per roll. The cheapest I saw them online was US$2.69 for 1 roll of the non-adhesive aluminum. I bought a brand new Dymo machine online for US$136.50 from B&H Photo. It seemed like a worthwhile expense for something that looks like it’s going to last a lifetime! There are also cheaper used and even vintage ones available on eBay. I really like the look of Dymo tape. It’s very utilitarian and also old-school. It reminds me of my childhood when I used plastic Dymo labels on almost everything I could get my hands on — schoolbooks, notebooks, and pencil boxes. So having it for my tree tags pleases me a lot! If you don’t really care for Dymo, then there are other, cheaper options. You can recycle aluminum cans or even venetian blinds into labels. There are is a lot of information online on how to convert an aluminum can into an embossed tree tag. 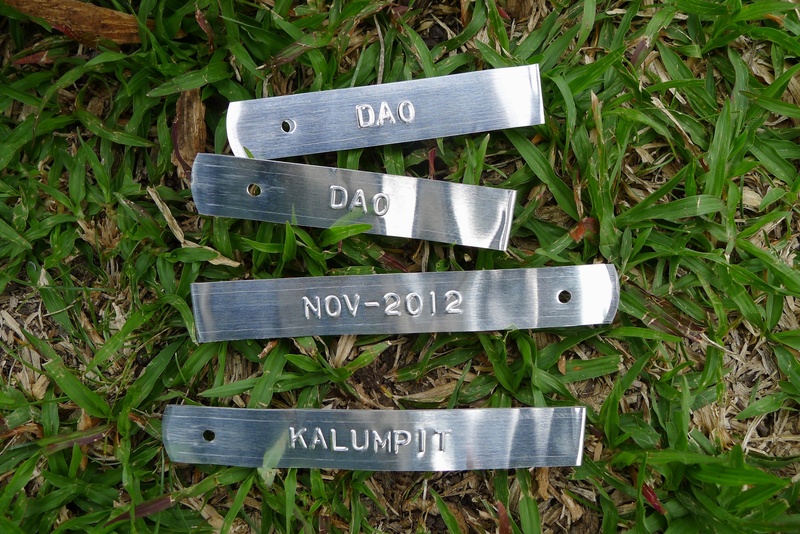 There are also forestry suppliers that sell blank tree tags that you engrave yourself. The next step was to attach them to the seedlings so that they can be easily adjusted as the seedling grows. 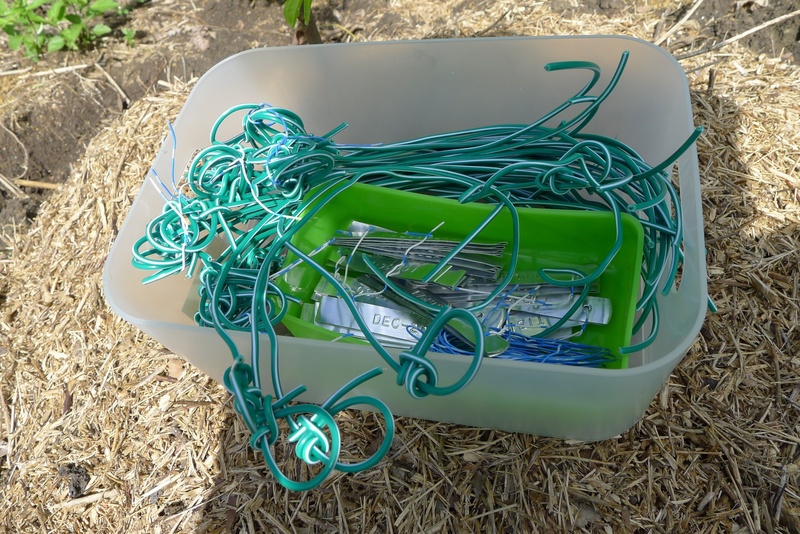 I decided to follow the bell wire method described in the State Forests of New South Wales Technical Paper No 59 Field Methods Manual, with some adaptations. I couldn’t find bell wire locally, so I substituted automotive electrical wire. It is a thin, plastic-coated copper wire and fits perfectly into the hole made by the Dymo label maker. I think the bell wire holds its shape more when bent. In the Field Methods Manual, they just loop the wire around the tree and then twist the end to form a noose. That didn’t work with the wire that I got. It looked like it would come off too easily. On one end of the wire, I made a tautline hitch. As the name indicates, this is a type of knot that is used when you want to keep a line that usually sags over time tight. It can be slid in one direction to tighten the rope and slid in the opposite direction to loosen the rope. This knot is used for things like clotheslines and tent lines. Then I cut the wire to an appropriate length. I made sure to leave enough allowance for future growth. I prepared enough wires and tags for all the trees. 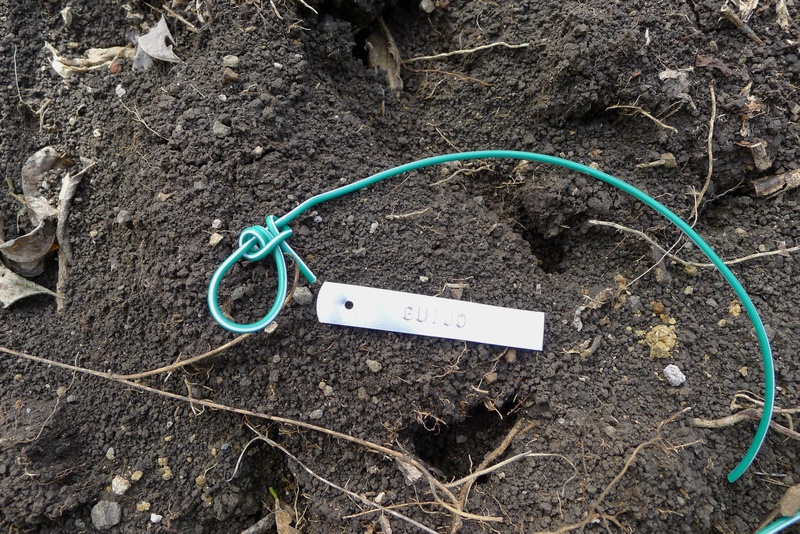 At the site, I slipped the wire off the loops so I could put the wire around the trunk of the sapling. Then I slid the wire back into the loops. The wire holds the shape of the loops, so it is easy to slip one end in and out of the loop. 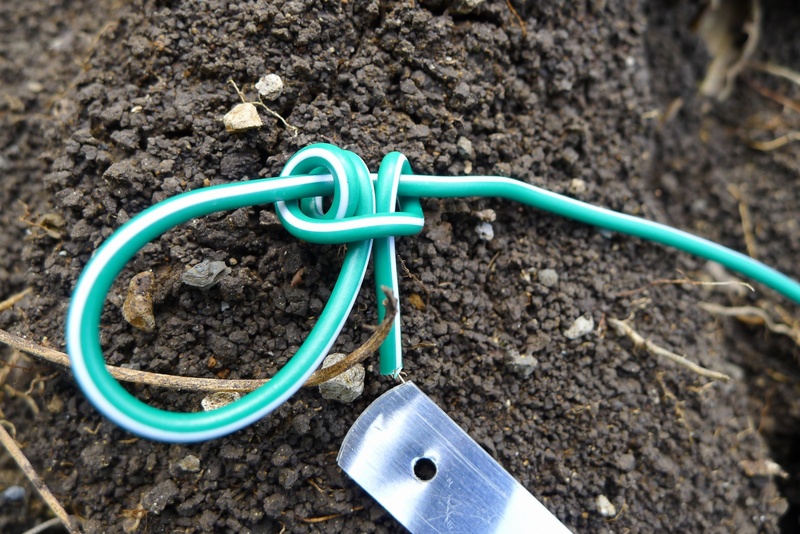 Then, I tied the Dymo tree tag to the long end of the wire using another knot, a bowline. This is another useful knot. It is very reliable and does not come undone, yet can be easily undone when necessary. As you might guess, I like tying knots! The final step is to tighten the loop just enough so that the tag stays at the desired height. And then you’re done! All finished — Dao seedling with tag! Sylvia: You are now my idol for obsessive compulsiveness! Thanks Carmela! I’m really happy with how these came out. The tags don’t slip down, they just stay in place. Would also like to note that the Rhino Dymo machine is easier to operate than the small, plastic Dymo machines of my youth. It requires significantly less pressure to emboss a letter than the small plastic Dymo machines. Thanks Maia! I am so excited to start planting trees again so I can make more tree tags! May I ask where you bought the tape? 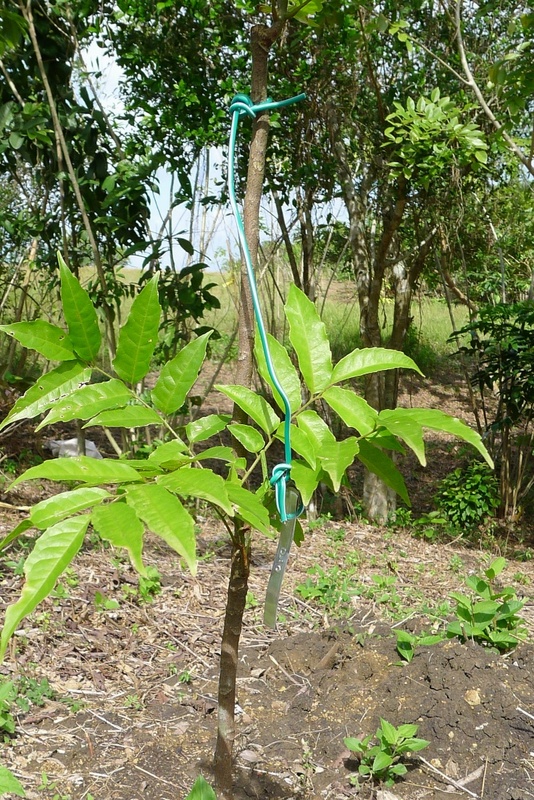 I am planting some trees in Argao, Cebu and your tags look like just the thing i’ve been trying to figure out, but can only find expensive non-adhesive alum tape online. Hi Mark, I bought the tape in Manila from HMR. They had them in boxes of 10 rolls. The original tag price was P350 per box and they were marked down 50%! Couldn’t believe my luck when I saw them! HMR is a big warehouse store that sells surplus items from the US, Canada, other places. Their merchandise varies. I haven’t been to HMR in a while, so I don’t know if they have the tape now. I found a lot of it in their Pioneer branch. Previous Previous post: Basic Botany – Learn the Lingo!